161 units situated on 21 acres on a promontory (ridge) overlooking the Onelea bay with view of the Islands of Molokai and Lanai as well as the West Maui mountains beyond. Spacious one and two bedroom apartments range in size from 1,300 to 2,200 square feet including lanais in low rise, two-level townhouses. A ten-minute stroll will lead to the Ritz Carlton Hotel, shops, Tennis Garden or the Bay Golf Course, and the magnificent beaches. Gas barbecues and a reception center. Our unit is quiet, located facing the green of the golf course. Over the green, you can see the twinkling ocean. Sit on the porch and have breakfast to the background music of birdsong, or enjoy beautiful sunsets – and at night, tons of stars. We were told that when Kapalua Ridge Villas were first offered, this was the third unit sold. Come and see why for yourself. It has been recently renovated with new carpeting throughout, new fans, flat screen TV’s in both the bedroom and living room. Maui No Ka 'Oi! is the Hawaiian phrase which means Maui is the Best – and this phrase certainly represents Kapalua, a special place on the northwest side of Maui. 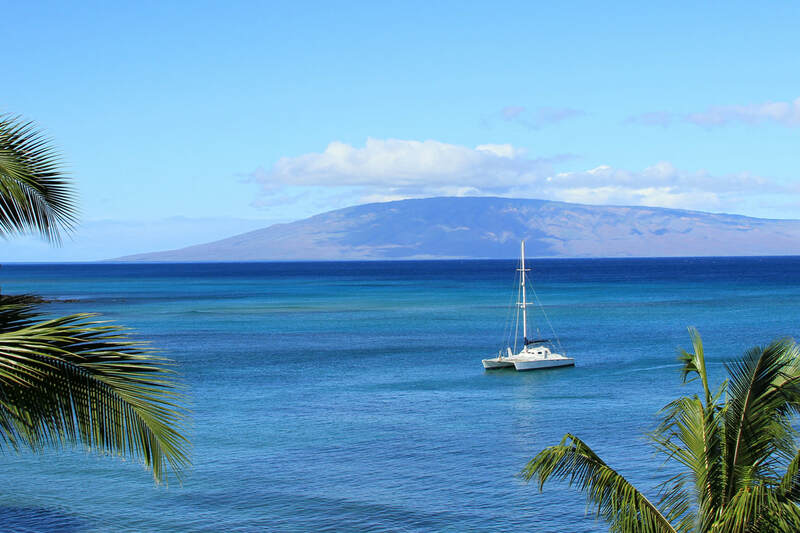 We happily invite you to stay at our condo, which has the best combination of relaxing Hawaiian accommodations and great views of Lava Point and Honolua Bay. Our one-bedroom two-bath unit is light and bright with a fully equipped kitchen and master bedroom suite upstairs. The local feel of the islands has been maintained with the artwork, furniture, and casual living atmosphere we have selected. Come to our part of paradise and enjoy the best of what Maui has to offer – Maui No Ka 'Oi!